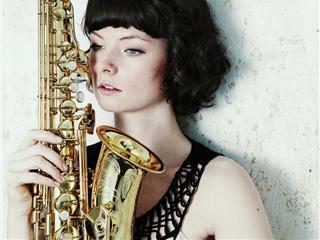 Jorja Chalmers plays keyboards and 2nd Saxophone on the Roxy Music 2011 'For Your Pleasure' tour. A glamourous multi-instrumentalist, Jorja was born in Sydney in the year of Avalon, 1982. Having studied at the Sydney Conservatorium of Music, she moved moved to London in 2004, immersing herself in the city's cutting edge music scene. She played sax and keyboards in cult band Hotel Motel who were described in the music press as being like 'a Roxy Music album cover brought to life'. This helped bring Miss Chalmers to the attention of Bryan Ferry, with whom she has been performing in concert since 2007. Aside from working with both Roxy and Bryan, Jorja's talents are much in-demand and she can also be found touring with acclaimed artists such as the Ting Tings and Patrick Wolf.